The establishment survey showed the economy created just 113,000 jobs in January. Coupled with the 75,000 increase reported for December, this is the weakest two-month stretch since December, 2010-January 2011. However, the picture in the household survey was much better, with the employment-to-population (EPOP) ratio rising by 0.2 percentage points from 58.6 percent to 58.8 percent. This matches the previous high for the recovery in October of 2012. The unemployment rate edged down to 6.6 percent. White workers disproportionately benefited from gains in employment with the EPOPs for both white men and white women rising by 0.4 percentage points. By age, the biggest gainers were younger workers. Employment for workers between the ages of 25-34 rose by 230,000, while employment for workers between the ages of 35-44 rose by 318,000, a one month increase of more than 1.0 percent. There appears to be some leveling off of employment among older workers. While there was an increase in employment in January of 151,000 among workers over age 55, this is still just 19,000 above the level reported for August. Since the beginning of the downturn employment for older workers is up by 5,537,000 while it is down by 6,586,000 for everyone else. This growth is largely attributable to the baby boom cohorts passing age 55. However it is also driven by much higher EPOPs among older workers. The ability to get insurance outside of employment as a result of the Affordable Care Act (ACA) may be a factor slowing the growth in employment among older workers going forward. 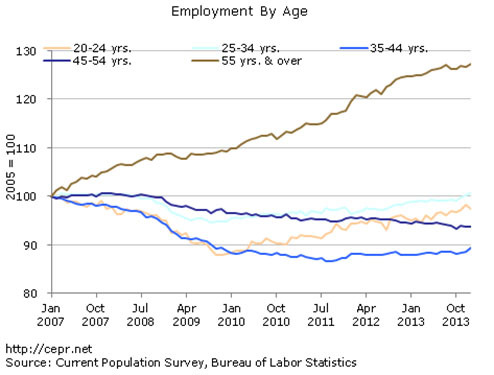 The data show no evidence that the ACA is increasing part-time employment. Involuntary part-time employment is down by 726,000 over the last year while voluntary part-time is up by just 246,000. The share of long-term unemployed fell sharply to 35.8 percent, the lowest since August of 2009. However this is likely due primarily to people dropping out of the labor force as their unemployment benefits expired. One clear negative in the household data is a drop in the percentage of unemployment due to people voluntarily quitting their job from 8.2 percent to 7.9 percent. The share of unemployment attributable to job leavers is still lower than the low-point for the prior two recessions. In addition to the overall weakness, the numbers in the establishment survey were unusual because the goods-producing industries accounted for the bulk of job growth, accounting for 76,000 jobs. Construction gained 48,000 jobs following a decline of 22,000 in December. Manufacturing added 21,000 jobs. Both sectors will likely to continue to add jobs throughout 2014, but at slower pace. Some of the weakness in the service sector likely just reflected seasonal factors. Specifically, retail showed a loss of 12,900 jobs after adding 126,900 in the prior three months. The January falloff likely reflects more than usual holiday hiring. There was a jump of 10,100 jobs for couriers reported in January. This will almost certainly be reversed next month. A drop of 400 jobs in health care, following a gain of just 2,400 reported for December, gives the weakest two-month growth in the sector for the length of the series. Job growth in hospitals has been especially weak, falling in both months. Weaker job growth in this sector will be a likely outcome of efforts to contain costs. Government employment fell by 29,000 with employment declining at every level, including 8,500 jobs in the Postal Service. Over the last year, federal employment is down by 68,400, excluding the Postal Service. Postal Service employment has fallen by 195,800, more than 25.0 percent, from its pre-recession level. In spite of the positive news in the household survey, this report coupled with weak numbers on construction and durable goods orders, raises concerns about the strength of the economy going forward. Many observers have attributed the weakness in recent data to weather. This is not plausible since the weather has not been especially bad for winter in the Northeast and Midwest. While future jobs reports are likely to show more growth than we saw in December and January, it is likely the figures will be closer to 150,000 than 200,000. Wages of production workers have outpaced those of their supervisors in this recovery. In this month’s jobs report, Dean Baker notes the December rate of labor force participation for black men is the lowest on record.